Dr. Krish Kandiah is Founder and Director of Home for Good, a charity seeking to find forever families for children in care in the UK; recently this work has taken him to Number 10 as he has campaigned for homes in the UK for refugee children. 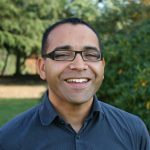 Krish is Honorary Vice President and Chair of the Theological Panel of Tearfund, and he is a Lecturer at Regents Park College, Oxford. Krish has authored eleven books including "Home for Good" and most recently "God Is Stranger". He is also a regular broadcaster on radio and television. Krish lives in Oxfordshire with his wife Miriam and four children.